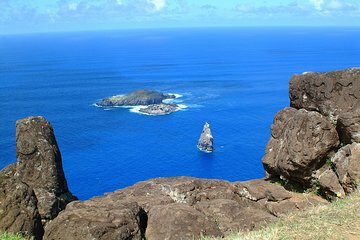 Mientras su barco espera en la terminal de cruceros, maravíllese con las antiguas ruinas de Orongo, un pueblo de piedra y lugar ceremonial en la costa suroeste de la Isla de Pascua. Durante esta excursión en tierra de 4 horas con un guía profesional, explorarás una misteriosa civilización en el complejo arqueológico de Tahai en el Parque Nacional Rapa Nui y verás el cráter volcánico Rano Raraku. Se incluye transporte portuario de ida y vuelta. Ver las casas de piedra y elaborar petroglifos de Orongo. Escuche leyendas del pasado en el complejo arqueológico de Tahai. No one showed up to meet us at the pier. This was a disaster. We booked a tour that was specifically designed for pick up from a ship. The tour operator knows that ship guests have to be tendered to the island and that it can be very rough due to swells. When we arrived there was no one waiting for us, when we found our way, with another couple, to the tour office, it appeared that they knew nothing about our booked tour. They called another representative who was unable to provide a tour. We wound up renting a car and seeing the island on our own which by the way is very doable since there is only one road around the island. If you have a tour book and a car, your're golden.